Iron tungstate (FeW) of the formula Fe2OH(H3O+)W5O18.11H2O was obtained in a granular form. Structural, dehydration and ion exchange properties of the material were investigated. Equilibrium studies demonstrated that the H+-rich FeW is beneficial with respect to Cs+ and Co2+ uptake. Mobility and diffusion mechanism of the radionuclides into tungstate particles were examined and discussed as a function of; reaction temperature, metal ion concentration, particle size as well as the drying temperature. Kinetic studies indicated that the diffusion coefficient (Di) of Cs+ and Co2+ in tungstate particles was increased not only in the order Cs+ > Co2+ but also with increasing the drying temperature of particles. In addition, the reduction in particle sizes of the FeW revealed an increase in both the exchange rate and the diffusion coefficient. 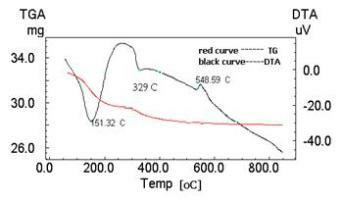 The values of diffusion coefficients as well as the other thermodynamic parameters were calculated and compared with similar systems.